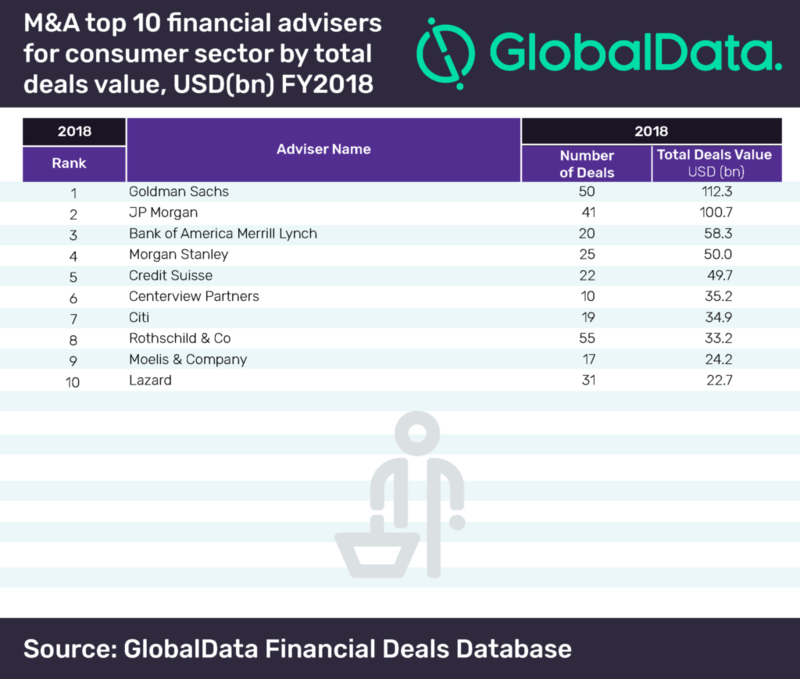 Goldman Sachs has dominated the latest M&A league table of the top 10 financial advisers for the consumer sector based on deal value in FY2018, compiled by GlobalData, a leading data and analytics company. The American bank advised on 50 deals worth a combined $112.3bn, including the industry’s top deal – Dr Pepper Snapple’s merger with Keurig Green Mountain for $18.73bn. According to GlobalData, which tracks all merger and acquisition, private equity/venture capital and asset transaction activity around the world to compile the league table, JP Morgan trailed Goldman Sachs, clocking in 41 deals worth $100.7bn. With 20 deals valued at a distant $58.3bn, Bank of America Merrill Lynch stood third. The consumer sector saw an increase in deal value and volumes in 2018 compared with 2017. The total value increased by 6.51% from $253.2bn in 2017 to $269.7bn in 2018. Volumes witnessed a 16.82% jump from 3,122 in 2017 to 3,647 in 2018. Interestingly, Goldman Sachs, which topped the consumer league table of M&A financial advisers, also took the top spot in the global league table of top 20 M&A financial advisers released by GlobalData recently. 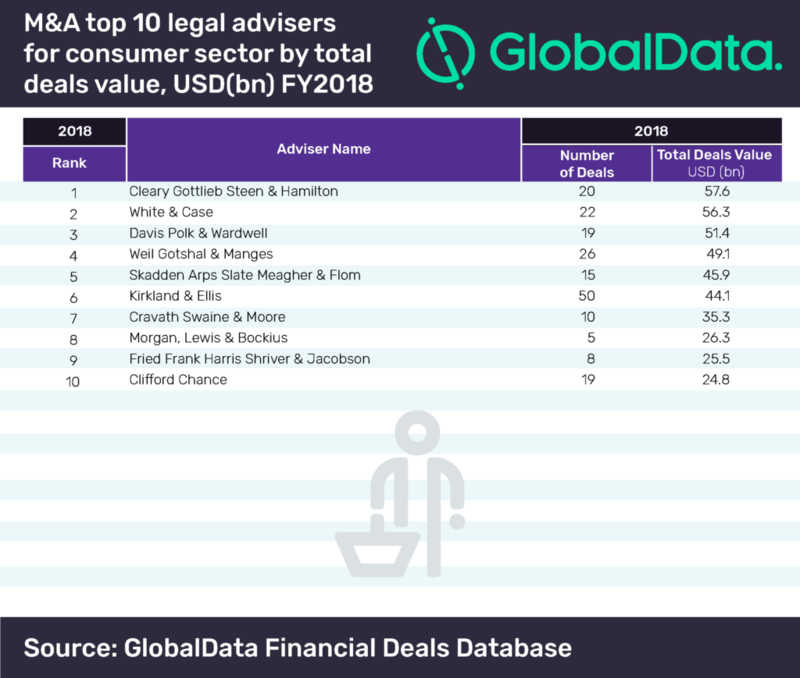 American international law firm Cleary Gottlieb Steen & Hamilton led the chart of top 10 legal advisers, in terms of value. It provided legal services for 20 deals worth a combined $57.6bn. The firm was ranked sixth in the global league table of top 20 legal advisers. Three out of the top five legal advisers in the consumer league table were associated with the industry’s top deal. Kirkland & Ellis, which figured at sixth position by value, led the volume chart with 50 deals.